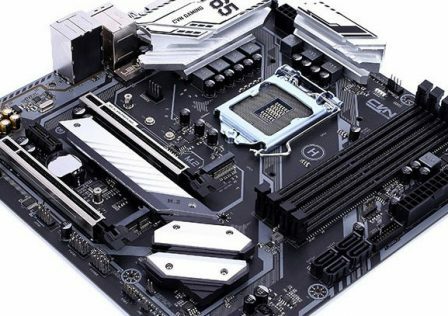 ASrock has just announced the release of its latest lineup of B450 chipset motherboards for AMD Ryzen processors, the B450 Legend Series. 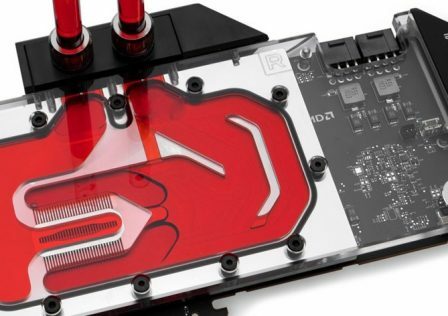 The new motherboards will be built using the highest grade parts available to ensure stable and reliable performance. 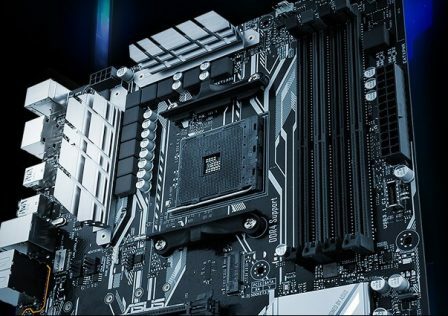 According to ASRock, the new series will feature massive oversized aluminum heatsinks, I/O armor, reinforced PCI-E slots to add to the overall toughness of thew board. 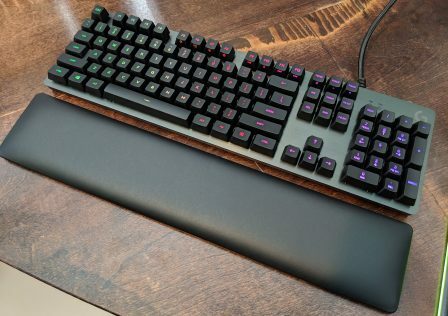 As far as components go, both boards provide stable power to the CPU thanks to the premium 60A power chokes and Nichicon black 12K capacitors. 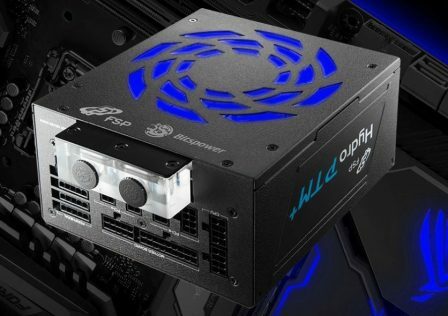 As RGB is a must with any build these days, ASRock has incorporated two RGB zones, one at the soutbridge heatsink and another at the rear I/O cover. 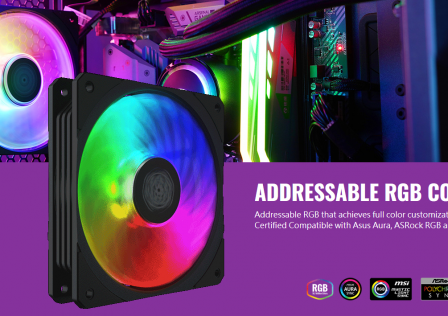 Users are able to modify the RGB colors and effects using the ASRock Polychrome software allowing LED sync between components. 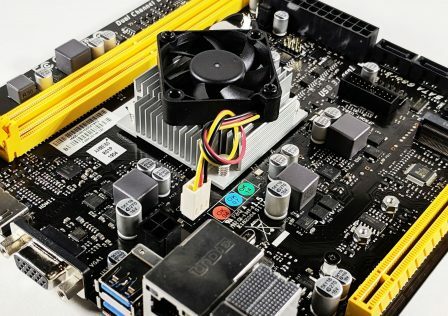 The obvious difference between the new motherboards are their physical size. 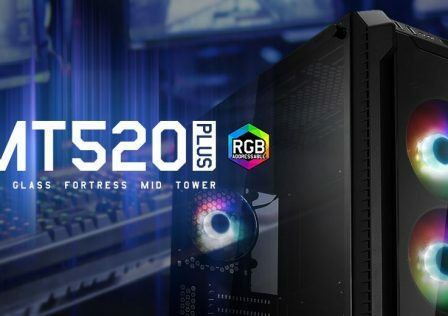 The Standard ASRock B450 Steel Legend will come in the standard ATX form factor while the B450M Steel Legend motherboard is smaller, fitting the micro ATX profile. 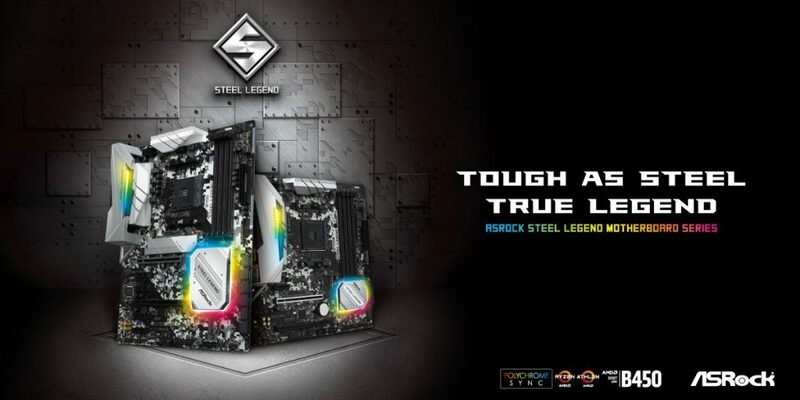 The ASRock B450 Steel Legend is a full-featured standard sized ATX motherboard. 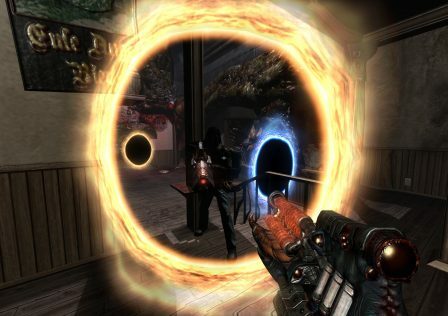 Processor support will be for the first and second generation (maybe third?) 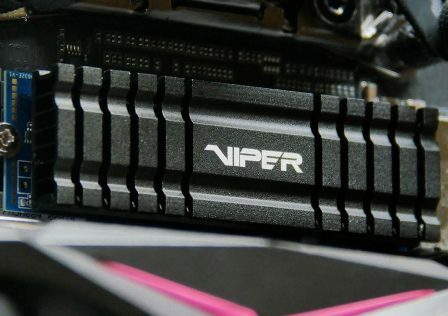 AM4 socketed AMD Ryzen processors with Radeon VEGA graphics. 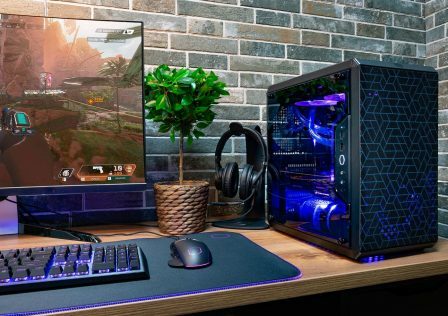 The rear I/O panel comes equipped with both HDMI & DisplayPort ports for 4K video when using AMD Ryzen and Athlon processors. SSD support is also included as the board features dual M.2 slots. The top slot is heatsinked featuring ASRock’s unique M.2 Armor reducing the temperature of M.2 SSDs. 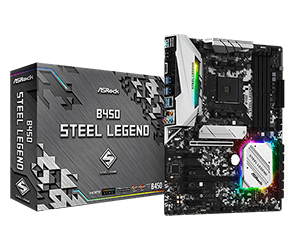 Additionally, the B450 Steel Legend features two USB 3.1 Gen2 (Type A, Type C), four USB 3.1 Gen1 Type A ports, and a Combo PS/2 port with USB 2.0 ports. 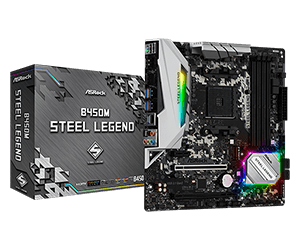 Like its bit brother, the Micro ATX version of the Steel Legend motherboard provides identical CPU support for AMD AM4 processors. 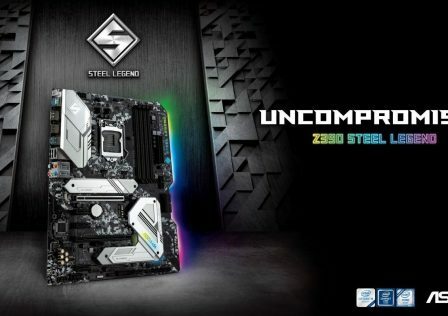 Because of size limitations, the B450M Steel Legend features less expansion slots. Overall, both boards specification-wise are pretty similar. 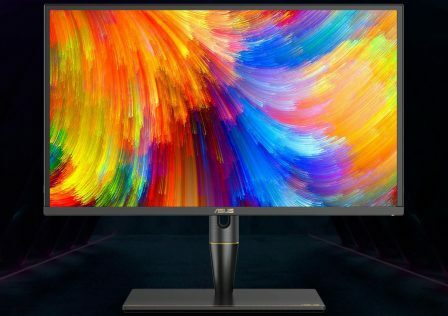 Supports 4K Ultra HD (UHD) playback with HDMI 1.4 and DisplayPort 1.2 Ports*Actual support may vary by CPU**The Max shared memory 16GB requires 32GB system memory installed. Gold Audio Jacks*To configure 7.1 CH HD Audio, it is required to use an HD front panel audio module and enable the multi-channel audio feature through the audio driver. HD Audio Jacks: Rear Speaker / Central / Bass / Line in / Front Speaker / Microphone (Gold Audio Jacks)*Ultra USB Power is supported on USB3_34 ports. 1 x M.2 Socket (M2_2), supports M Key type 2230 / 2242 / 2260 / 2280 / 22110 M.2 SATA3 6.0 Gb / s module and M.2 PCI Express module up to Gen3 x2 (16 Gb / s)***M2_2, SATA3_3 and SATA3_4 share lanes. If either one of them is in use, the others will be disabled. **If M2_1 is occupied, PCIE4 will be disabled. ASRock Easy RAID Installer*These utilities can be downloaded from ASRock Live Update & APP Shop.